Delaware Sen. Tom Carper admitted in 1998 to slapping his wife and giving her a black eye after previously denying the incident during his first run for Congress in 1982, according to a report Thursday from the Washington Free Beacon. 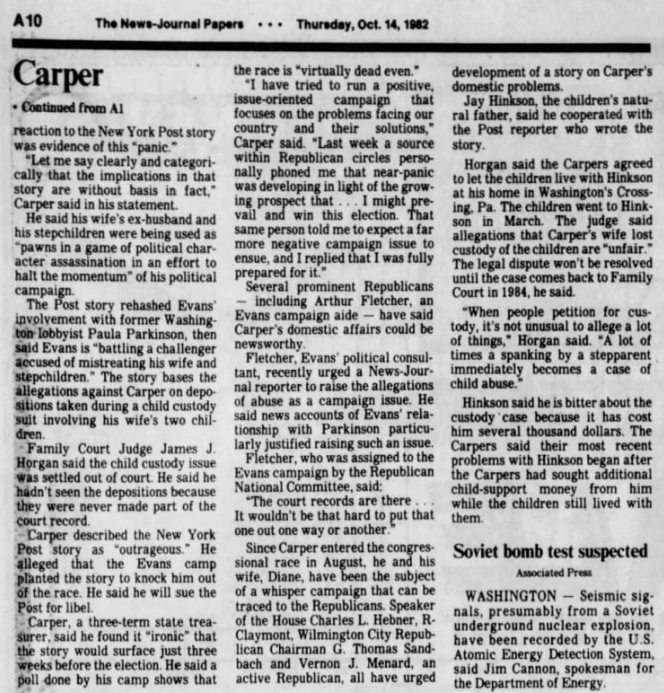 Carper called the accusation “without basis in fact” during his first run for Congress and promised to sue the New York Post, which first published the accusation in 1982. He admitted to the incident 16 years later, but little has been reported about the incident since. “Did I slap my wife 20 years ago? Yes … Do I regret it? Yes. Would I do it again? No,” Carper told reporter Cilia Cohen during a 1998 interview for her 2002 book, “Only in Delaware.” He crafted a different message during his 1982 congressional campaign, according to the report, which is based on an analysis of publicly available documents. Carper, a Democrat who has criticized colleagues in the past over sexual assault allegations, attacked his Republican opponent that year for his “vicious” efforts to smear his family. 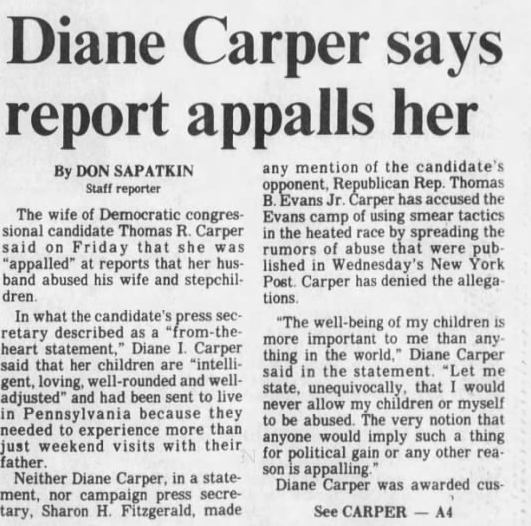 The New York Post’s report was based on a taped deposition of Carper taken as part of a custody fight between his wife, Diane Carper, and her first husband. She eventually vouched for Carper’s story and blasted the New York Post’s reporting on the issue. The Franken revelation came amid accusations former Alabama Republican Senate candidate Roy Moore harassed multiple teenage girls during the late-1970s. It also comes on the heels of several media exposes on Hollywood producer Harvey Weinstein suggesting the titan spent years assaulting young actresses. Carper’s Senate office has not responded to The Daily Caller News Foundation’s repeated requests for comments about why the senator denied and the admitted to acts of domestic abuse.